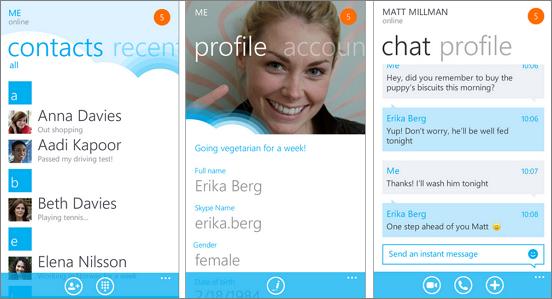 Skype is now finally available for windows phone. This has been one of the most awaited app for windows phone. After released beta version on February. Skype for Windows Phone helps you connect with friends and family instantly with free voice and video calls everywhere you go. Make affordable calls to landlines and mobiles using Skype Credit, create and hold one-to-one and group chats (even while in the middle of a call), and update your profile and account information, among others features. With Skype on your Windows Phone, you can join the thriving community of 200 million people using Skype every month across almost any screen: smartphones & tablets (running Android, iOS, and Symbian), computers & laptops (Mac, Windows) and connected TVs. Now it is Available for use on 4G, 3G and WiFi networks. Skype for Windows Phone is also now available in 18 languages: English, Danish, Dutch, Finnish, French, German, Italian, Japanese, Korean, Norwegian, Polish, European Portuguese, Brazilian Portuguese, Russian, Simplified Chinese, Spanish, Swedish, and Traditional Chinese. It requires Windows 7.5 ("Mango") or higher version phones. See this below short video to know how is working this App.